The Super Sorter All-In-One is ideal for pedestrian-concentrated reas including parks, city centers, shopping malls, and so forth. It is built to be durable, long-lasting and easy to empty. With its security features, attractive design and flexibility in indoor/outdoor applications, they are an excellent solution for centralized recycling and waste collection. All Super Sorter Series products come with Super Sorter Openings to ensure high quality separation of recyclables. Emptying is as easy as 1, 2, 3! The 519 series is designed for the separation of cans, bottles, paper, etc. 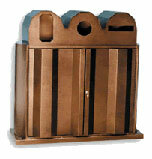 A special bracket allows the container to hang on the wall to save space. The 549 (A/B) series is a mid-sized container designed for the collection of various materials in offices, cafeterias, and other high-volume areas. The 549A is designed for the separation of cans and bottles. Its narrow profile allows it to snuggle titghtly against the wall in high traffic areas. The container comes with a round hole in the lid and the appropriate recycling decals. The 549B is designed for the source separation of fine paper and newspaper. Its streamlined design makes it easy on space, and on the eyes. 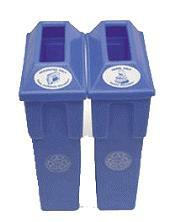 The container comes with a rectangular slot in the lid and the appropriate recycling decals.